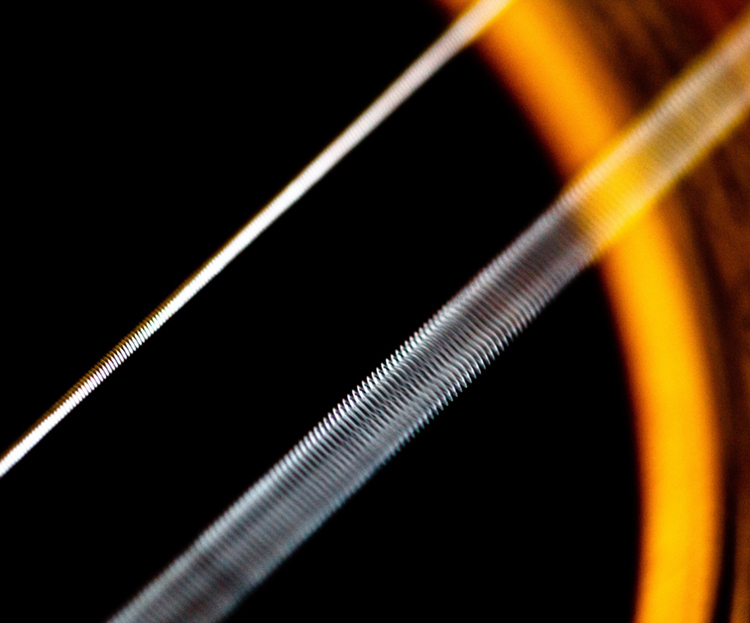 Observe the vibrations of a guitar string. Determine the frequency of oscillations. A cycle is one complete oscillation. Note that a vibration can be a single or multiple event, whereas oscillations are usually repetitive for a significant number of cycles. We can use the formulas presented in this module to determine both the frequency based on known oscillations and the oscillation based on a known frequency. Let’s try one example of each. (a) A medical imaging device produces ultrasound by oscillating with a period of 0.400 µs. What is the frequency of this oscillation? (b) The frequency of middle C on a typical musical instrument is 264 Hz. What is the time for one complete oscillation? The frequency of sound found in (a) is much higher than the highest frequency that humans can hear and, therefore, is called ultrasound. Appropriate oscillations at this frequency generate ultrasound used for noninvasive medical diagnoses, such as observations of a fetus in the womb. The period found in (b) is the time per cycle, but this value is often quoted as simply the time in convenient units (ms or milliseconds in this case). 1: Identify an event in your life (such as receiving a paycheck) that occurs regularly. Identify both the period and frequency of this event. Periodic motion is a repetitious oscillation. 1: What is the period of electrical power? 2: If your heart rate is 150 beats per minute during strenuous exercise, what is the time per beat in units of seconds? 3: Find the frequency of a tuning fork that takes to complete one oscillation. 4: A stroboscope is set to flash every What is the frequency of the flashes? 5: A tire has a tread pattern with a crevice every 2.00 cm. Each crevice makes a single vibration as the tire moves. What is the frequency of these vibrations if the car moves at 30.0 m/s? Each piston of an engine makes a sharp sound every other revolution of the engine. (a) How fast is a race car going if its eight-cylinder engine emits a sound of frequency 750 Hz, given that the engine makes 2000 revolutions per kilometer? (b) At how many revolutions per minute is the engine rotating? 1: I visit my parents for dinner every other Sunday. The frequency of my visits is 26 per calendar year. The period is two weeks. 16.2 Period and Frequency in Oscillations by OpenStax is licensed under a Creative Commons Attribution 4.0 International License, except where otherwise noted.